I've featured Anna Piaggi on this blog in late November. I went over that post again and discovered I still love those photos. She's so deliciously outrageous! 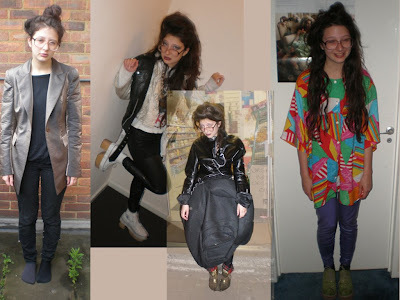 Also, one of my constant source of inspiration is Vievienne Westwood. I'm sure I've mentioned it before. The reason I'm saying this now is because they both have an eclectic style. Obtaining it isn't generally just throwing in a bunch of different items and hoping for the best. There's also a small study that needs to be done. I'd call it an art because you have to know the limits to master it. Now I'm not claiming I'm good at putting together such an outfit, but isn't this a good start? Sara states she doesn’t want other people’s perceptions to affect the way she constructs her image. More reason to admire her. Go here to read the entire interview and see more outfit photos. I love the way Sara dresses. I wish I was so adventurous!